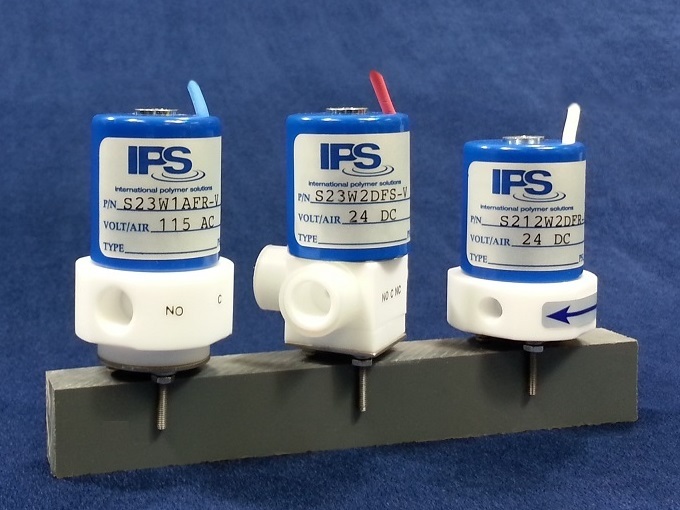 3-Way PTFE Subminiature Solenoid Valves – International Polymer Solutions, Inc. Plastic solenoid valves can be found in a wide range of applications and industries due to their workhouse nature within just about every application in which they are used. In order to determine what type or specifications of plastic solenoid valve are right for you and your application, we suggest finding a plastic solenoid valve manufacturer. A manufacturer with experience in your industry or application can better understand and meet your requirements, resulting in an overall superior product for you. Solenoid valves are typically controlled electromechanically, meaning that it is a mechanical device that is operated through the use of electric current to achieve a goal. The only difference between plastic solenoid valves and other types of solenoid valves comes down to the material they are made from. Other than that these solenoid valves operate virtually identical to one another. This commonality between all forms of solenoid valves is the reason behind why you can find plastic solenoid valves in such a wide range of applications, from use in a standard household vacuum cleaner to being the backbone of a complicated piece of manufacturing equipment that utilizes large industrial sized valves. Plastic solenoid valves are often used in applications where moisture is present, as other forms of material such as different metals and alloys may deteriorate or experience other functional issues due to prolonged exposure to moisture. Plastic, on the other hand, can thrive in these types of environments. Similarly, any application where electric current or corrosion are a danger, plastic solenoid valves are used to reduce these types of issues. So consult a trusted, experienced plastic solenoid valve manufacturer to see if your application can benefit from a plastic solenoid valve over a traditional valve. In some cases, a plastic solenoid valve will not only operate better but will also offer lower costs. Plastic Solenoid Valves A solenoid valve is a device that is used to adjust, control, switch, and actuate movement within other devices. Plastic solenoid valves are simply solenoid valves made from plastic materials which provide added value to certain applications over other solenoid valves which may be made from other forms of materials.